Help do your bit to save Britain’s bees! Although not exclusively, this day is suitable for any responsible adult and child between 10 and 18 to partake in and share in a single Warre hive construction with tutor Neil Cruickshank. 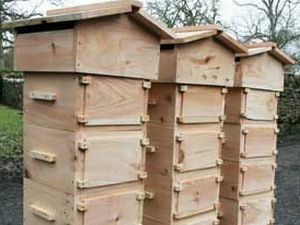 This style of hive is most advocated by natural beekeeping enthusiasts as it represent a ‘beehive for bees’ rather than for beekeepers. Building their own honeycomb entirely (as they do in the wild) reduces the incidence of any potential wax borne challenges to a bee health, systemic or residual being passed from generation to generation through the wax.